Trek carbon frames not sure if all or just some are made by Quest Composites the same company that makes Canyon carbon frames. A 2nd tier carbon manufacturer I would say but then perhaps they still make some high end carbon frames in the US. The only way for you to do anything about this is for you and millions of other cyclists to refuse to play. I just ordered some cooking utensils made in USA and payed three times as much as Asian sourced equivalent. You willing to do that for your next bicycle? sigh, this is different. I am talking about the TOP MODELS. therefore making it relevant. the high ends were mostly built in the US. The top-level Madone frames are the ones made in the USA...that's it. Now, whether or not that's the bike that most people would want, it is the one people will pay for. Curious where you get your information from, as the site will not load. The [carbon bike] boxes come into the US from Taiwan (Giant). Well if the site loaded you would see Trek and Canyon images plastered all over the place. I came to find out the information in another forum because I thought Canyon were made by Giant but in fact it was only the aluminium frames that were made by Giant the carbon frames were made by Quest I was told. Sure enough I found the Quest site and the information was clearly there. Giant carbon frames have become more expensive than some of their competitors so have lost contracts as these brands have gone to cheaper supplier's (Quest, fuji-ta and others). From what I've read Giant and Merida are the top players with regard carbon frame quality. Merida do Specialized frames (they jointly own the Specialized company). A lot of these past classic US and European brands are simply slapping their brands on Chinese imports with a huge markup. I tend to favour Giant because at least they are an actual manufacturer. They design and make their bikes themselves with high weight limits, generous lifetime warranties and good customer service. The big bike manufacturer is fuji-ta though. They are huge, approaching 20 million complete bicycles made a year plus a huge OEM business of supplying frames all around Asia, Europe and the US to assembling factories. You can see many of the brands they manufacture for on their video here but in fact the number of brands is much larger than this. In the US you probably get more complete bikes made by them but in Europe we tend to get more bikes assembled outside China with fuji-ta frames and exported to Europe to avoid EU duties. They only thing they don't do is the very cheap dual suspension mountain bikes and very low end bikes, or if they do do them they are too expensive to sell many to the US and Europe, there are cheaper manufacturers for those. Fuji-ta frames are actually very high quality despite their low price as you can see from the manufacturing processes below. Getting a bike with a fuji-ta frame is a good thing compared to some Asian manufacturers who have more basic facilities. Vietnam, Cambodia, Bangladesh and other countries are now cheaper for bike manufacturing than China so there is migration to those countries. At the moment the need for high quality certified frames means they still come from China with final assembly of bikes is in those countries but from what I understand a lot more steel frame manufacturing is going on there now and aluminium is likely to follow in the future. go on eBay and buy the last of the US made emonda slr's which is what i just did. My 11 year old Cannondale has a USA-made frame, and I decided that if I wanted a new bike to supplement it, it was gonna be either American or at least European built. next go around I definitely will look into that also a wooden bike wood be cool. renovo. Most Treks are not made here. Last edited by gettingold; 03-28-18 at 05:07 AM. If it matters to you, many of the ti bikes are made here. Bikes: To the right: opinions, not facts. Velonews published the above article six years ago and it's just as relevant today. Absent political considerations, don't worry about where your frame was made. The convoluted OEM and parent company relationships in the modern bike world make tracing origin almost impossible anyway. Brands go to great lengths to obfuscate where their frames are actually coming from, especially legacy European ones. Happily, in terms of quality, none of this really matters. If you do have political hang ups and insist on North American or European manufacture, prepare to focus on a handful of tiny brands and prepare to pay a sizeable premium. However, I wouldn't do so assuming you're getting higher quality. You're not. Cannondale still makes all of its frames in the USA. Alas, they quit making any frames in the US a couple of years ago. They're designed in America...which is more important than where it is made. They're invented in America...they'll never take that away from us. China GRADUATES every year, as many engineers as CURRENTLY PRACTICING in the US. Taiwan makes very high quality stuff. So does China these days, if you (the designer) pay extra for premium quality control. But I would still be hesitant to purchase a bike made in India, for example, because their industrial infrastructure is still relatively primitive. Also, a seldom-considered factor in industrial manufacturing, is the EPA. Besides far higher labor wages, it is far more expensive and difficult to manufacture most things in the United States (and Europe) than Asia, because of the strict rules on disposal and remediation of toxic chemicals and byproducts from manufacturing. In China, all that toxic waste is just dumped in the ocean or buried in a landfill. Basically they're making the same mistakes that we did in the United States 50+ years ago. They'll pay for it in the long term, just like we are with hundreds Superfund disaster cleanup sites. While the end product can be just as high-quality as a bike made in the USA, the sustainability of manufacturing methods is typically not the same. Gary Klein dumping toxic paints and solvents resulted in him creating a Super fund site.. Trek took over his brand , as I recall..
CAD CAM programs can be emailed around the globe to places with CNC machine Tools where overhead is most advantageous. 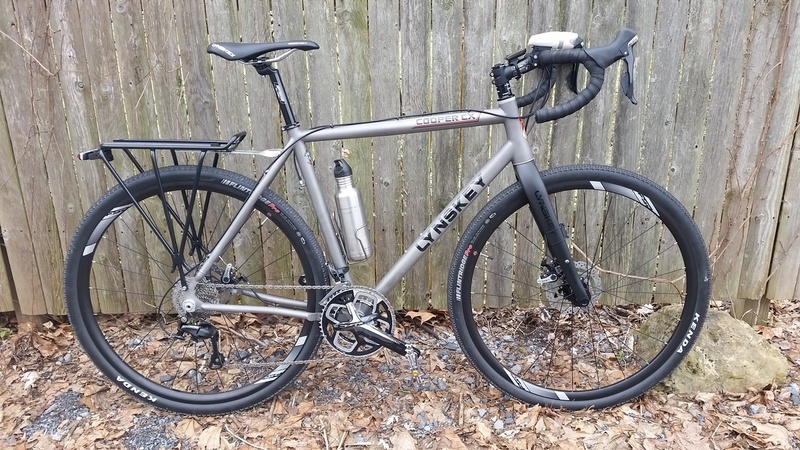 The last bike I bought (nearly 4 years ago) was built 12 miles from my house in Philly. Custom ti frame that was under $4,000 (Enve fork sold separately). So if there are custom ti frames from Asia for one third that price I guess I was willing to do so.